Who knew making a wooden seat could be so complicated? 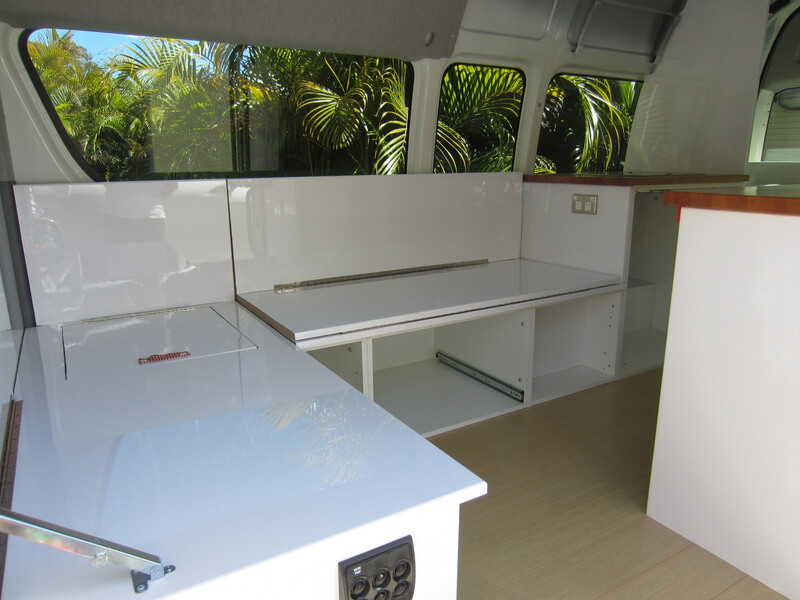 Well ours has been very complicated, but having spent the last couple of weekends playing with hinges and bolts and sliding locks, Paul has now fixed and secured all the campervan seating. Let’s hope we’ve finally seen the last of the comedy seesaw moments. 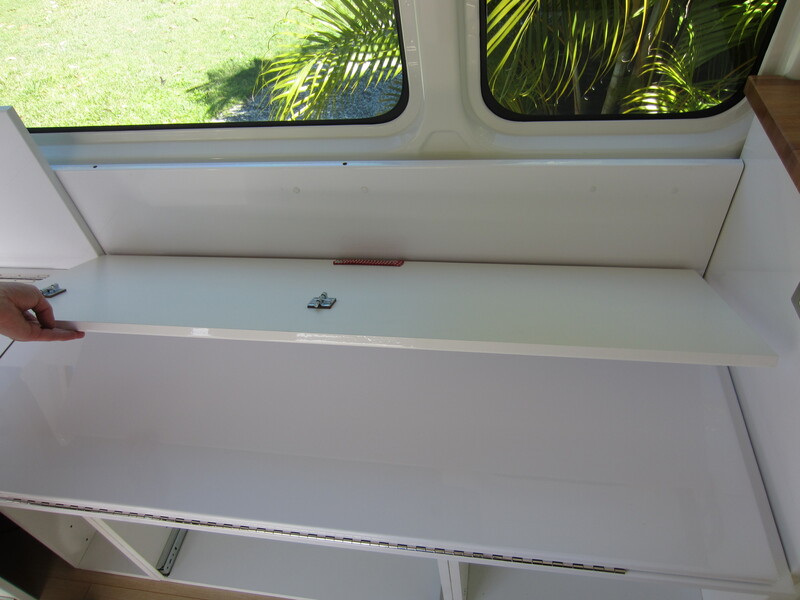 The seats needed a bit of adjusting from their original position to allow for a 28mm overhang all around to protect the cupboard doors underneath. Once the seating panels were all screwed down, Paul turned his attention to the backrests. 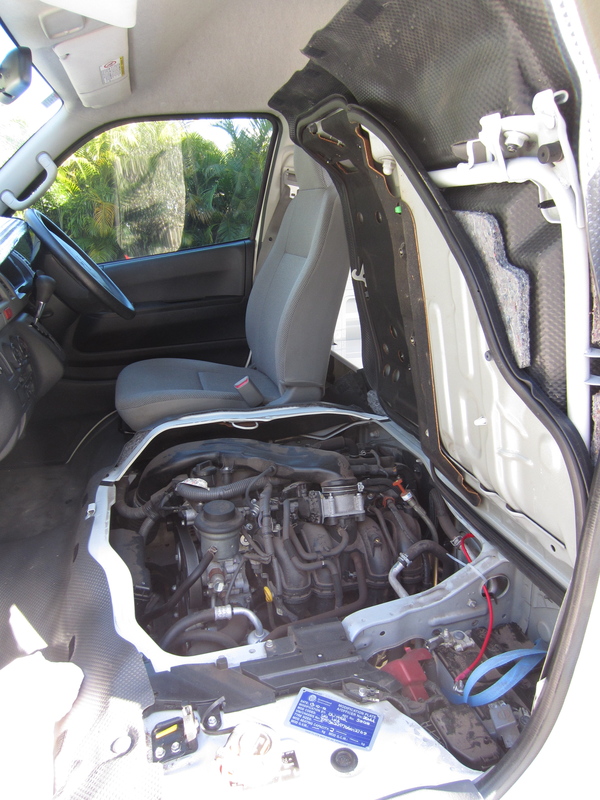 Because the engine is underneath the driver/passenger seats, we had to hinge the backrest behind the cab to allow the front seats to still lift up and provide access to the engine. And because the backrest doesn’t lean up against anything, Paul also fixed a small arm hinge at the side and a sliding lock at the back to strengthen it when it’s in the upright position. 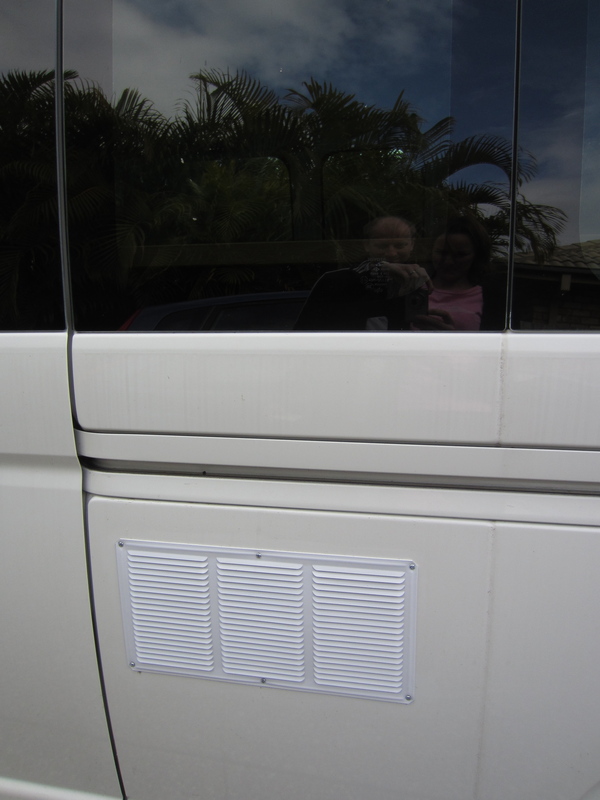 The other backrest also had to have a sliding lock behind it to stop it falling forward. It’s this backrest which pulls over to form the bed support, and it’s really quite heavy to lift. To make this job a bit easier, I did attempt to fashion a handle out of a few scraps of gingham I had lying around (as you do). Unfortunately though, while clearly very beautiful, my handle was not up to the job and suffered major structural failure on its first outing. 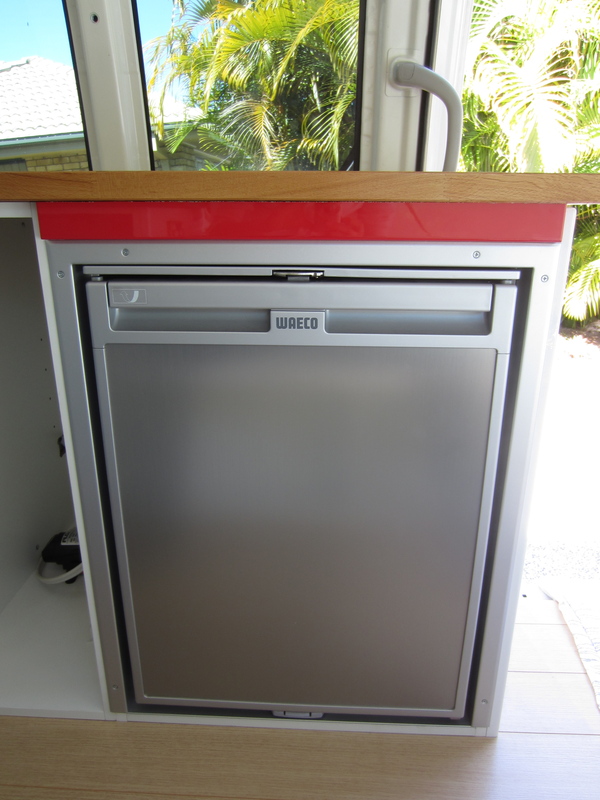 We might just buy a metal one from Bunnings. 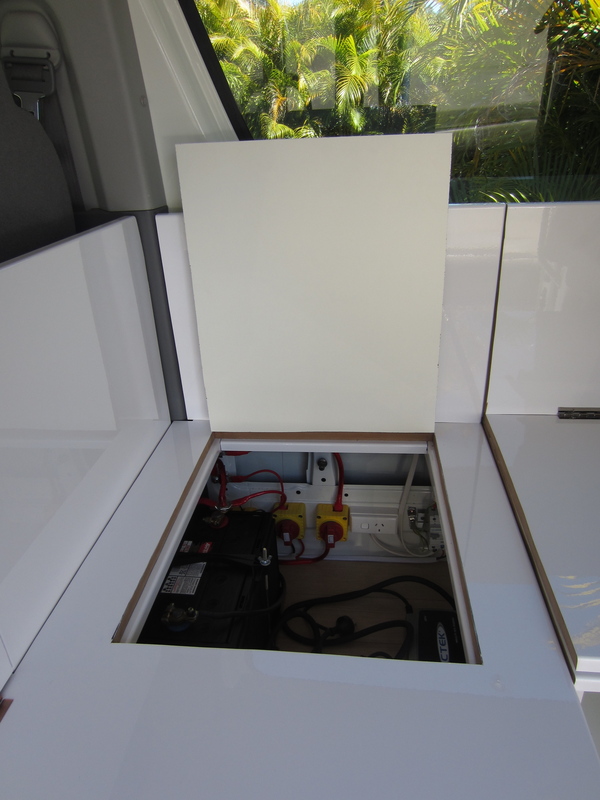 The final stage in the seating was to make a trap door (with fully functioning custom-made handle) above the battery compartment to give easy access to all the electrics. 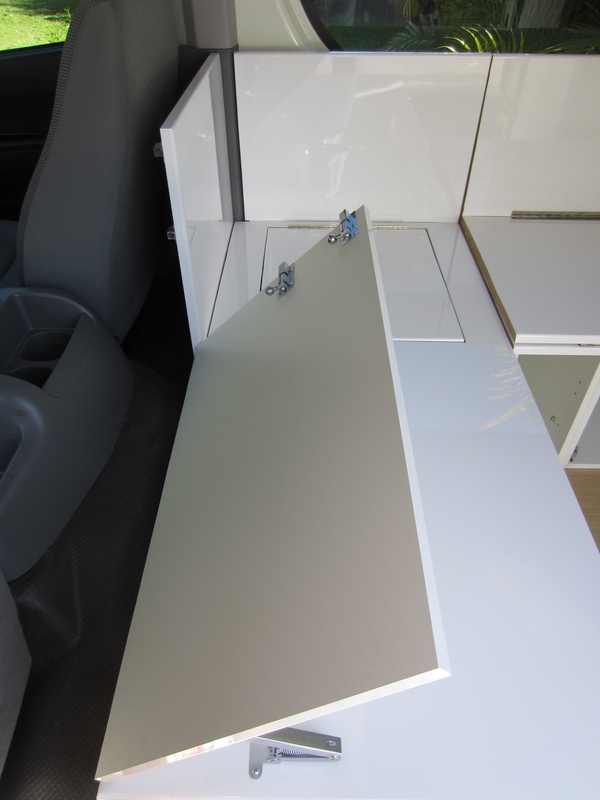 The kitchen work surfaces are also now secure, having been screwed down to the cabinet shell underneath with small right angle brackets. 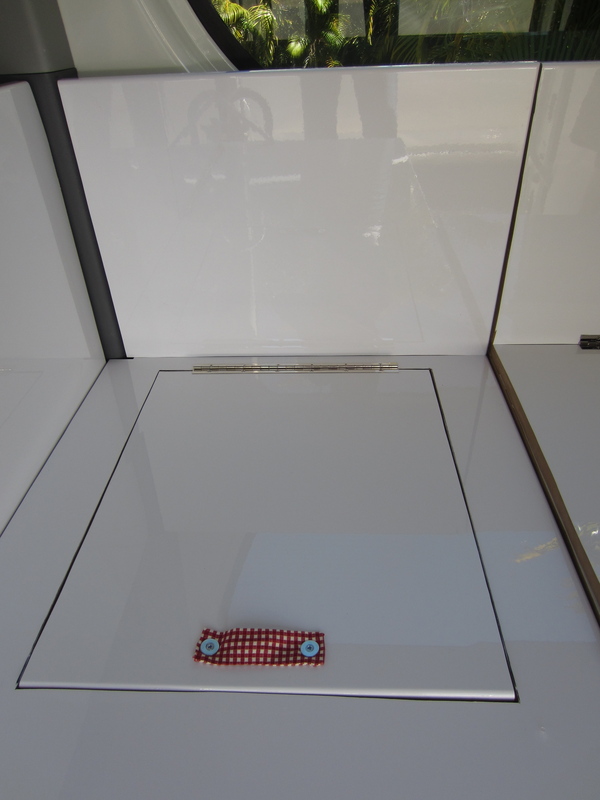 Paul fitted a gloss white side panel onto the cabinet containing the fridge, and added a water indicator, which will link to the fresh and wastewater tanks. So the seating is completely finished. Stay tuned for phase one of the plumbing! 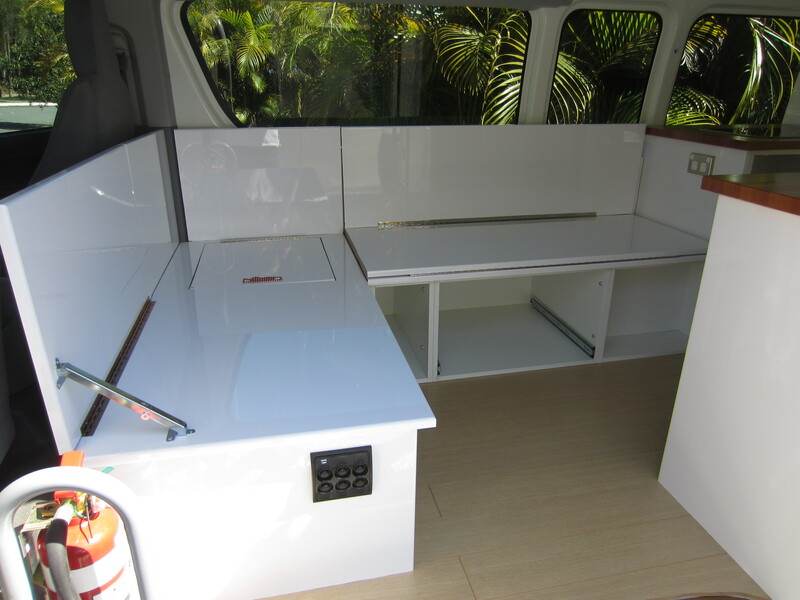 This entry was posted in Building a diy campervan, Campervan seating/bed conversion and tagged building a campervan, campervan bed, campervan cabinets, Campervan conversion project, Campervan design, campervan kitchen, Campervan photos, campervan seating, Converting a campervan step-by-step, converting campervan seating into a bed, DIY campervan by Rach. Bookmark the permalink. Very impressive. Glad Paul is an engineer!!! Only two more weekends to go???? Thanks Neil. Yes two-ish I reckon, give or take a couple of months. There’s no rushing him! Hi great camper! I recently bought an old school bus (short) and plan on making a mini rv. I was wondering if you had any plans or instructions for your couch/bed design. I think it would go perfectly in my bus. Thanks for stopping by! 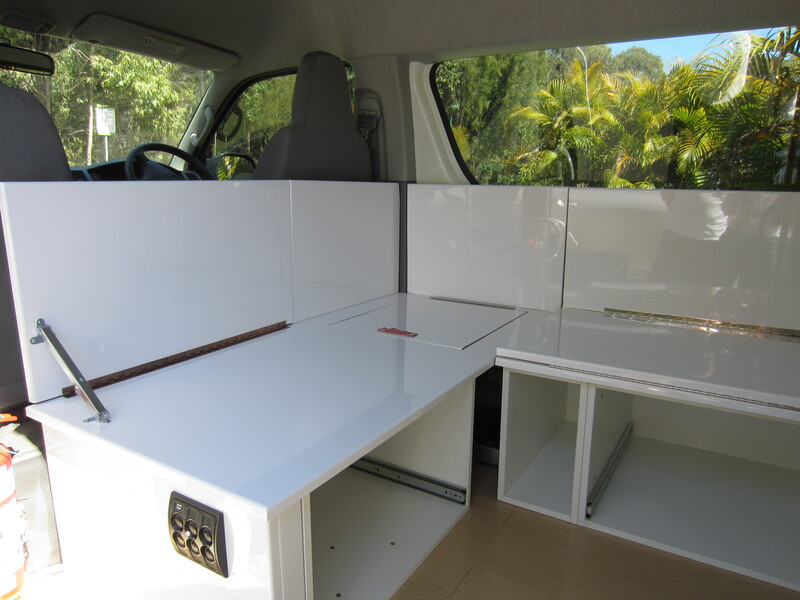 Did you read this post: https://campervanconverts.com/2011/06/13/how-to-convert-campervan-seating-into-a-bed/ which has more detailed instructions? It’s basically just three pieces of wood which are hinged so the backrest can fold over to form a support in the bed configuration. 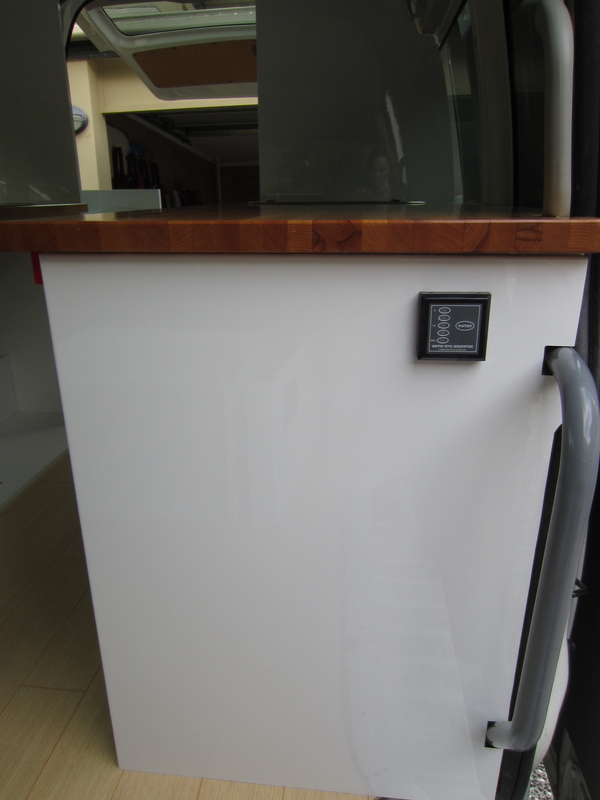 Ours works really well, and it’s definitely a good option in a small space. Hope that helps! Hey just wondering what sort of hinges did you guys used for your bed? And where did you buy them?